We go hand-on with Nintendo's latest home console, the Nintendo Switch. And in typical Nintendo fashion it is at once impressive, charming, and confusing. It was hard to not to feel a little confused watching Friday’s Nintendo Switch reveal. Although we got a good at look at the hardware and its features, when it came to the game side of things (outside of a handful of Nintendo titles) you got the impression that the system was still a long way from being consumer ready. Once the presentation was over we could only recall two titles that would be available at launch on March 3. With one of the two, The Legend of Zelda: Breath of the Wild, also being released day and date for Nintendo’s current console -- the Wii U. The wonderfully weird looking (in terms of seeing Mario run around New York style streets) Super Mario Odyssey is slated for a Holiday 2017 release. Super Mario Kart 8 Deluxe in April, the new and intriguing ARMS dated for some time in Autumn, and even the now kind of old The Elder Scroll V: Skyrim coming sometime this Spring. It’s certainly worrying. Or, begs the question, why aren’t more games going to be ready in-time for launch? Leading up to the Nintendo Switch reveal we were of the impression that Nintendo were looking to move away from the limited library that plagued the Wii U upon release, or if you go back far enough -- the launch of the Nintendo 64. During the reveal, we were expecting to be shown several original titles from Nintendo and its stable of studios to convey what the Switch was all about. In the end, we were shown two – with the more intriguing ARMS not being ready in time for launch. The first game shown, 1-2-Switch was presented as is – a collection of mini-games to showcase the portability of the console and the tech packed into each tiny Joy-Con. Interesting sure, but it was hard to shake the feeling of Wii déjà vu. And with 1-2-Switch being sold separately, admittedly at a lower price, one wonders why it wasn’t announced as a pack-in title. But as they say, seeing is believing. So, we decided to reserve any judgement until we got to go hands-on with the console. Which we did at an event held in Melbourne, the following day. Seeing the Switch in person the first thing you notice is how small it is, a lot smaller than what you’d expect. And that’s not small in a negative sense, but in a sleek, stylish and modern one. It’s thin, incredibly so. And light, comfortable, and bright too. Once you see Zelda and Mario Kart running on it, it almost feels like magic. Especially when you switch between handheld mode and the console being docked and projected onto a TV in a matter of seconds. Initially the plan was to make a by-line for Zelda, get some quality Hyrule time in before venturing out into the uncharted waters of futuristic boxing (ARMS) and quick-draw shooting (1-2-Switch). Turns out that was the plan for a lot of people, so I was left to wander around the space and take in the Switch from afar. A new open-world Zelda game is an exciting proposition to say the least, and having such a game as a flagship launch title for a new console is worth pointing out. Plus, for a Zelda fan Breath of the Wild looks like it could possibly be a franchise best. And the trailer that was shown at the Nintendo Switch reveal almost made up for the somewhat awkward presentation that preceded it. Instead my first Switch experience was with the F-Zero inspired ‘Fast RMX’, playing it both on a TV screen with a Pro Controller, and in handheld mode with the Joy-Cons connected to the Switch unit on each side. Because hey, it was a free booth and I was there to play some Switch. And although it was a game I hadn’t heard of before, Fast RMX was impressive. If oddly titled. And there’s something to said for testing out a new console with a futuristic driving game. One of my first experiences with the Super Nintendo in the early ‘90s was F-Zero, so in a way it felt like coming home. And thankfully the controls were responsive and the Ikaruga-style colour switching that changes your vehicle’s engine from blue to orange to go through all the different boosts was an interesting and fun take on the genre. Fast RMX is shaping up to be a solid racer no doubt, and one that we’re keen to check out again. A Breath of Fresh Air. New Zelda! The Nintendo Switch’s 6” screen is bright and sharp in a way that Nintendo handhelds have never been. Playing the new Zelda game in handheld mode you get the impression that you’re playing something that probably wasn’t meant to be played this way. Like a hobbyist that has modified an old console, attached a screen, and let you play a classic title in your lap. Originally a Wii U title, The Legend of Zelda: Breath of the Wild was quite possibly never meant to be played as a handheld title. And even though the Wii U has second screen functionality, when it dawns on you that you can play the Switch anywhere, at any time, it’s hard not to walk away impressed. When viewed as a standard console connected to a TV, the situation is entirely different. In your hands the lush environments and wonderful animation of Breath of the Wild are gorgeous. On a larger screen, they still look great but you can see the edges and technical shortcomings. Especially when compared to consoles like the PS4 and Xbox One. In strict visual terms the Switch is an improvement on the Wii U, but only slightly so. On paper that may sound like a fatal mistake made on Nintendo’s part, but for a handheld it’s more than enough. And makes a great first impression. If played that way. As for The Legend of Zelda: Breath of the Wild, getting to play through a small chunk of the opening was enough to convince me that it’s going to be something special. Not that it needs anymore hype. But the fact that it adopts a few open world mechanics from other developers, like activating towers to reveal all nearby locations on the map, to giving you the freedom to get distracted with silly things like starting grass fires with a torch, speaks to the scope of the game. 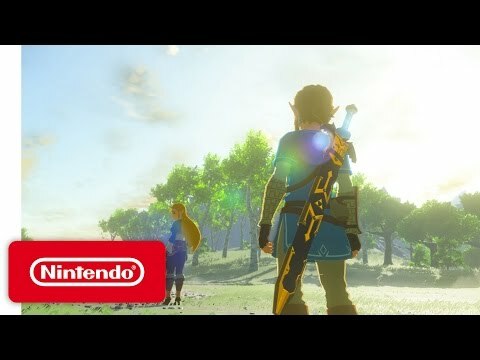 Throw in RPG and survival mechanics, classic Zelda combat and character interaction, and Breath of the Wild feels like the most ambitious entry in the franchise since its transition to 3D graphics in the late ‘90s. But even though Zelda, and Mario Kart 8, and Splatoon 2 all looked and played great on the Switch, being a new Nintendo console meant that you should expect to see something new from Nintendo itself. And unexpected. 1-2-Switch is a game that offers up two-player mini-games where each player holds one of the Joy-Con controllers and take part in activities that don’t require much if any screen interaction. In fact, pretty much all the games demonstrated required players look each other in the eye. A bold, if questionable move on Nintendo’s part. That translates to quick-draw events where the first to shoot wins, a samurai game where one players swings and the other player tries to catch the sword before it strikes them. There was also milking (of the dairy farm variety), a few balance games and table tennis. So yeah, it’s not really a traditional game per se but it’s fun in its own way. And reminiscent of the wackiness of the Wario Ware series. The only downside being that 1-2-Switch looks like the sort of pack-in title that is fun for a crowd but something that would grow old kind of quickly. As a technical demonstration 1-2-Switch is almost entirely focused on the new Joy-Con controllers. Which although tiny are impressive in that they’re more responsive than the Wii-motes in terms of motion control, and the new rumble feature accurately conveys movement within the controller itself. It’s a shame that ARMS won’t be ready in time for launch, as it’s certainly a better showcase for the console’s new controllers. First and foremost, it’s not a glorified version of Wii Boxing. In fact, if we had to compare it to something else we’d point to the mecha combat arcade title Virtua On from Sega. Because in ARMS each Joy-Con not only acts as a fist, but a floating joystick that forces you to tilt in unison to move left or right, block an incoming attack by pointing them inward, and press multiple buttons to jump, dash, or activate a special attack. It takes a little while to get the hang of, but once you do it’s, well, awesome. And like Virtua On each fighter you choose has a different playstyle, which can be customised even further with different glove combinations. In ARMS motion control are not a gimmick, but the basis for a strategic boxing title that oozes personality. But to be enjoyed properly, as with any two-player fighting game you’ll need all the peripherals. In this case an extra set of Joy-Con controllers, which will set you back a somewhat startling $119.95. As a first look we came away from the Nintendo Switch event impressed. The console itself is impressive in its size and performance as a handheld. The Joy-Con controllers may be small but games like ARMS showcase their versatility and complexity. Zelda looked great on the small screen, and impressed on the big screen too. In a lot of ways what was shown felt like a sleeker version of the Wii U. But then again, a lot of that was due to the library of titles shown, an almost best-of list from Nintendo’s last console thanks to the inclusion of Mario Kart 8 Deluxe and Splatoon 2. Super Mario Odyssey may be coming towards the end of the year, but the plumber’s absence closer to the Switch launch makes that seem like a lifetime away. Third-party support is there, but not enough of it to make you feel in anyway comfortable. A fact that’s becoming a Nintendo console staple these days. And then there’s the price, $469.95 AUD for a machine that is noticeably inferior to the PS4 and Xbox One in terms of raw performance. And more expensive. In fact, from a technical standpoint the Switch is more PS3 and Xbox 360 than the current generation of home consoles. Also, for that price you don’t get any games. 1-2-Switch will be sold separately, a title purposely built to showcase the new Joy-Con controllers. And something that could have easily been a pack-in game ala Wii Sports. But we also understand why it’s not. The Switch isn’t just about motion controls. It’s an amalgam of Nintendo ideas, the logical conclusion of its hardware forays of the preceding decade, from the Wii to the 3DS and even the Wii U. So, the game line-up features a little bit of everything. And by little bit we mean just that, as there’s not a huge library of content coming in 2017. And then there’s the questions that remain. What does the UI look like? How will it perform? What sort of application support will there be? Will there be Virtual Console stuff on day one? Why is the new Nintendo Online service scheduled to debut later in the year and not at launch? Are the 25-30 games announced so far for 2017 going to be indicative of 2018 too? In addition to impressive, ‘uneasy’ would be another one word to describe the Nintendo Switch reveal. We certainly had a lot of fun playing most of the titles showcased so far. ARMS was a blast, and Zelda was, well, Zelda. The only problem was that we were left with as many questions on the way out as we did going in.